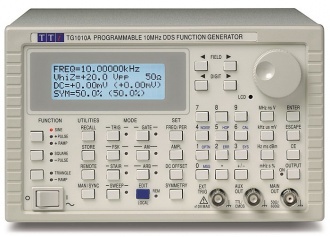 0.1mHz to 10MHz range, 7 digit resolution. Eight standard waveforms, plus “complex” waveforms, true arbitrary waveforms and noise. Powerful modulation modes including Sweep, AM, Gating, Trigger/Burst, FSK and Hop. Variable symmetry, variable start/stop phase. Programmable via RS-232 or optional GPIB interfaces.